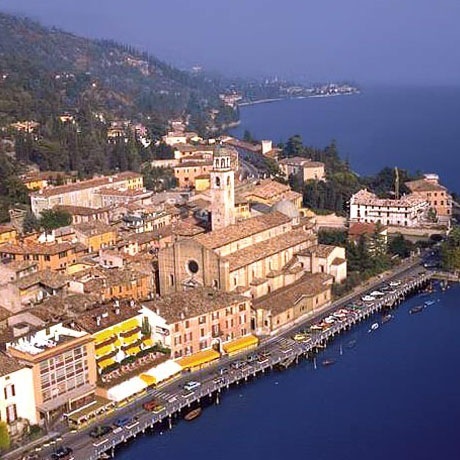 The charming lakeside town of Salò is a perfect destination for your wedding in Italy. Located on the shores of romantic Lake Garda, it is surrounded by lovely olive groves, wonderfully panoramic vistas and is one of the more enchanting lake towns to explore. Salò is a pleasure to discover on foot and each Saturday morning in the main Piazza an enormous market is held offering everything from antiques to foodstuffs. Take the time to stroll through the cobbled streets and window shop or sit at a café watching the local life. The wedding hall of Salò is one of our favorite Italian wedding locations; a wonderful Palazzo completely restored with magnificent staircase and frescoes inside. Everything you would wish for a superlative wedding in the North of Italy. The Palazzo faces the lake and is in the historic heart so that your wedding photos will be able to take full advantage of this wonderful location. Nearby there is a selection of Italian villas or palace hotels for your wedding reception or a variety of local restaurants ranging from the rustic to the sophisticated. Lake Garda is one of the most spectacular Northern Lakes and Salò is an idyllic setting to celebrate a romantic wedding in Italy. Verona and Venice and other key cities are within one hour’s drive, so you can visit them on your honeymoon in the Veneto region!